I recently had the pleasure to meet a dynamic young South African who is creating some wonderful products using the addictive flavour of Italian Black truffles and local naturally produced food products; She has created 3 different combinations with the Black truffles, a stunning Truffle honey using Cape wild flower honey, a Truffle salt using salt from the salt pans in the Kalahari desert and a delicious, creamy Truffle mayonnaise. Truffles have a highly pungent flavour therefore combining them with plain food allows the maximum enjoyment of the truffle taste. I used all three in the following recipes. First I roasted a chicken and basted it with the Truffle honey. I served this with plain fettucine tossed in Crème Legere (from Normandie) sprinkled with Truffle Salt. 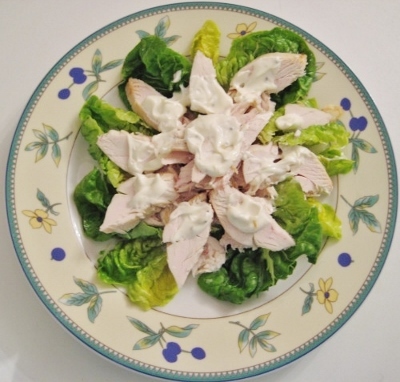 I then sliced the cold chicken and mixed this with the Truffle mayonnaise and served it on a bed of salad. It was delicious and so easy. The salad is ideal if you know that you have a power cut looming and need cold dishes that are interesting and have plenty of flavour. I suggest serving these dishes with an earthy wine to complement the truffle flavour such as the St Cosme Cotes-du-Rhone Rouge from the southern Rhone region. Remove cover from chicken and cook for 20 minutes until golden. Once cooked, strain off water. Sprinkle about half a teaspon of truffle salt (according to your taste) over pasta. Remove chicken from oven and baste the outside with 2 or 3 teaspoons of truffle honey. Take the left over cold chicken and remove all the meat from the bone. Decorate a flat plate with the salad leaves. 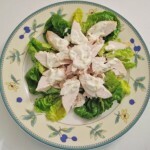 I recommend serving this salad with a dry Rose wine such as a Triennes Rose from Provence.